When most people think of puppies and young dogs, they think about their playful attitudes and insatiable appetites. Canines are known for eating anything you put in front of them. Because of this reputation, it can be very alarming when your new puppy starts to experience stomach issues. The puppy years are a very crucial time for dogs. They're developing rapidly and need a high-quality diet to ensure that they grow up into healthy adults. If you notice that your puppy has a sensitive stomach, you need to address the problem as soon as possible. Dogs can experience upset stomachs for a wide variety of reasons. For most dogs, one-off gastrointestinal problems are often a result of eating something they weren't supposed to. However, some dogs are simply more sensitive to certain types of food. To ensure that your dog is getting all the fuel they need, it's a good idea to invest in a limited-ingredient dog food formula. Limited ingredient dog foods are just that. They have fewer ingredients in them to decrease the chances of your dog experiencing tummy issues. The ingredients that are used are of a higher quality to ensure that your puppy is getting all of the nutrients they need to stay healthy. There are many different limited ingredient options out there, allowing you to find a good product for your dog no matter how unique their allergy is. Whether your dog is allergic to grains or a common protein source, limited ingredient dog foods can be the dietary solution you're looking for. This dry kibble from Blue Buffalo is great for pups with sensitive stomachs because it uses unconventional ingredients. They offer great nutritional value and support your dog's growing body as they get older. Instead of chicken or beef, deboned turkey and turkey meal are used for protein. They're the only proteins you'll find on the ingredient's list. Healthy complex carbohydrates and fiber-heavy foods are also used. You'll find peas, brown rice, and pumpkin. Canola oil, flaxseed, and fish oil are also included. They provide a healthy dose of omega fatty acids that can keep your dog's skin and coat supple. 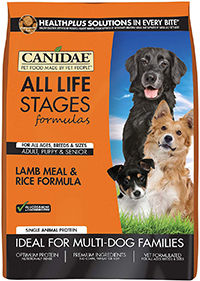 If you're looking for a high-quality dog food that can support your pup throughout his or her life, consider this formula from Canidae. 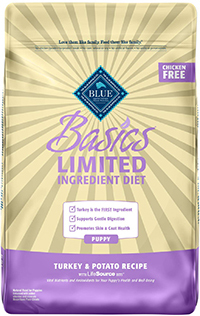 It's a nutritionally dense dog food that's filled with great ingredients. Lamb meal is used for protein, making it a great option for pups with a sensitive system. Various grains are used in the recipe. These include cracked barley, brown rice, and flaxseed. To ensure that your canine companion is getting all the minerals and vitamins they need, various supplements are added. One thing you don't have to worry about is unnecessary chemical additives. Natural mixed tocopherols are used for preservatives. 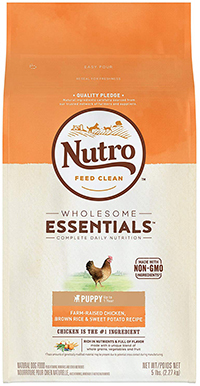 The Wholesome Essentials dog food from Nutro is made with simple ingredients that are sourced from established suppliers across the country. Everything is non-GMO, so you can rest assured that your puppy is getting a great meal that's healthy for them. For this particular recipe, farm-raised chicken is used as the main protein source. It's accompanied by lamb meal. Healthy omega fatty acids are included as well. To help your young pup develop strong bones, calcium is added. Ingredients like blueberries, dried carrots, and split peas give your canine plenty of beneficial vitamins to support their developing body. 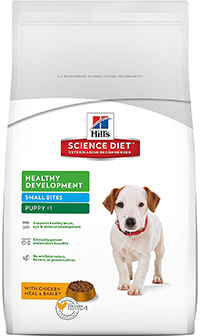 This dry kibble from Hill's Science is specifically formulated to meet the needs of small puppies. The kibble size is small enough for tiny mouths and developing teeth to process. More importantly, each piece is packed with high-quality ingredients that can support their overall development. Chicken meal and pork meal are used for protein. They're joined by a wide range of ingredients that are easy on your pup's system. A healthy dose of fiber will keep your dog regular while vitamins, minerals, and omega fatty acids support various bodily functions as they grow. 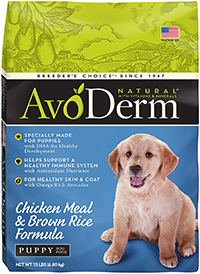 Another great dog food that's made with puppies in mind, the AvoDerm Natural formula is easy for sensitive stomachs to handle. It's very digestible, making it a great option for pups that have a harder time with other dry kibbles. About 26 percent of the recipe is made up of protein. It comes from chicken meal and herring meal. Alfalfa meal and dried beet pulp provide an excellent source of fiber. This product is free from unnecessary fillers like corn, wheat, or soy. There are also no artificial flavors, colors, or preservatives. How Can I Tell That My Puppy Has a Sensitive Stomach? There is a very big difference between having a normal upset stomach and having a sensitive stomach. The symptoms are very similar for both. However, the key is to make note of how severe the symptoms are. All dogs are bound to experience these symptoms at some point in their lives. It's when they become a regular occurrence that you need to be concerned. The main symptoms of a sensitive stomach are loose stools, vomiting, and excessive gas. The offending ingredient can cause a very unpleasant reaction in your dog's body. It won't be absorbed. In some cases, it's treated like a foreign invader and is attacked by the immune system. If your dog has a sensitive stomach, these issues will occur more frequently. However, the severity of the symptoms will be moderate. If your precious pup suffers from these problems abruptly and severely, you need to take them to a veterinarian as soon as possible. It may be an indicator of a more serious underlying issue. When humans ingest something that they're allergic to, they suffer physical issues in addition to gastrointestinal problems. The same goes for dogs. As mentioned earlier, certain ingredients may be attacked by the immune system. This can lead to rashes and itchy skin. Depending on how bad the reaction is, your dog may scratch so much that they end up bleeding. Needless to say, it's not a comfortable thing to go through. You should take your dog to a vet for more in-depth allergy testing. Stomach sensitivity can be caused by a number of different things. Some dogs have iron stomachs that aren't affected by unhealthy ingredients of inedible objects. Others can't even switch foods without having to deal with the consequences. It's a good idea to know the triggers so that you can be better prepared to provide your pup with some relief. When you're raising a puppy, you'll have to deal with them eating inedible items on a regular basis. Young pups are naturally inquisitive creatures. They explore with their noses and mouth. It's not uncommon to find them chewing up your shoelaces or trying to destroy a random piece of trash they found. Unfortunately, all of those non-food items wreak havoc on the digestive system. Obviously, they can't be absorbed. Instead, they'll have unwanted reactions within your dog's body, leading to discomfort, vomiting, diarrhea, and more. 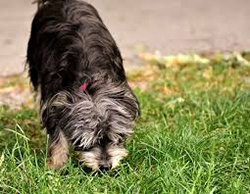 Grass and sticks are one of the most common non-food items a puppy will eat. For some reason, many canines love the taste of grass. However, many dogs throw it up immediately after they consume it. It's not clear why dogs do this. Some believe that they eat grass to purposely throw up when they're feeling unwell. Some think that it's simply because they love the smell. Whatever the case may be, it's important to put a stop to this behavior as soon as possible to avoid gastrointestinal pain. Not all dog foods are made with high-quality ingredients. Some unscrupulous manufacturers utilize ingredients that do more harm than good. Artificial additives and chemical preservatives should be avoided at all costs. They won't agree with your dog's system and may cause additional health problems down the line. Oftentimes, dogs gain access to foods they shouldn't be eating. For curious canines, there's nothing more enticing than a smelly trash can. Unfortunately, they'll often consume toxic ingredients in the process. We all know that dogs can't have chocolate because of its lethal amounts of theobromine. However, did you know that the list of toxic foods for dogs has a lot more than just chocolate on it? They can't have grapes, garlic, onions, artificial sweeteners, and so much more. Even small amounts of a toxic ingredient can cause major stomach issues for your dog. There are a lot of things in human food that aren't healthy for dogs. As previously mentioned, many of the things we find innocent and delicious can be poison for your young pup. Not only that, but human food is simply doesn't meet the nutritional needs of your dog. 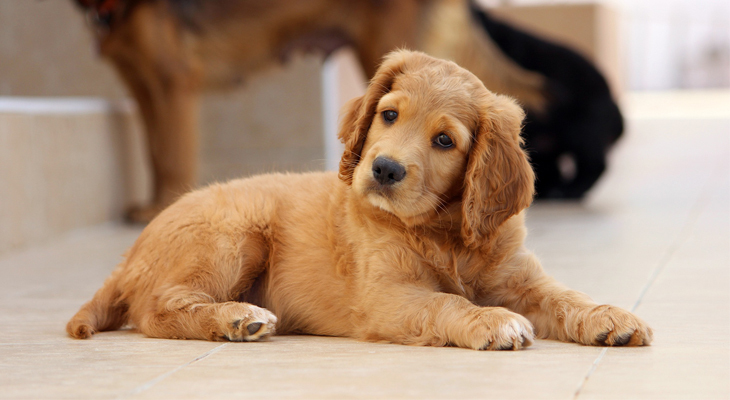 The dietary requirements of your growing puppy are much different than your dietary needs. They require more protein, fewer carbohydrates, and less fat. Feeding your dog human food can lead to significant health issues and obesity. Many common ingredients in commercial dog foods are known to cause some stomach sensitivity issues. Some of the most common are corn, wheat, and soy. These ingredients can be found in cheaper dog foods as fillers. They're not the easiest thing for pups to digest. Furthermore, they don't offer much in terms of nutritional value. Some dogs are allergic to grain-based ingredients. If that's the case things like barley, rye, and even rice should be avoided. They contain gluten proteins that aren't processed correctly in the system. This type of allergy is very similar to Celiac's disease in humans. Puppies may also be intolerant to common ingredients that are otherwise beneficial and healthy. Many dogs can't consume common proteins like chicken or beef. It's important to address food intolerances directly. The longer you wait to make changes, the more discomfort your pooch will feel. Not only that, but increased exposure could lead to hypersensitivity. Once your dog is hypersensitive to a food ingredient, the effects of exposure will be much more serious than some simple vomiting or diarrhea. Your dog's genetic history may also be the cause of their stomach upsets. Some breeds are more genetically predisposed to suffering from food allergies than others. These dog breeds include Yorkies, Great Danes, Scottish Terriers, Shar-Pei's, and more. Canned foods are great for younger puppies that have difficulties eating dry kibble. Typically, it's recommended that you provide canned food during the first few months of life. Like dry kibble, canned products can be made with limited ingredients to keep your pup's stomach healthy. 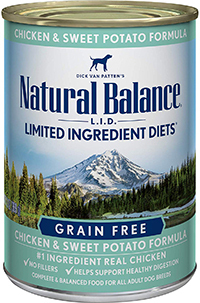 Natural Balance's Limited Ingredients Diet line is a superb choice for combating the symptoms of a sensitive stomach. This canned food option is something that your dog will love. It has chicken and chicken meal for protein. For carbohydrates, sweet potatoes are used. This ingredient is a complex carbohydrate that can keep your puppy's energy levels up throughout the day. The formula doesn't contain any artificial additives. Instead, natural alternatives are used. For example, chicken broth and natural smoke flavor make it an enticing treat that any canine will enjoy. If your pup has a gluten allergy, you'll be happy to know that this canned food is completely grain-free. 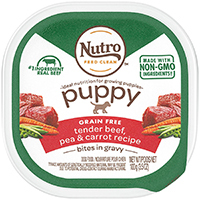 Another great option from Nutro is this wet dog food for puppies. It comes in a convenient plastic container that's completely sealed for freshness. Once you pop the foil off, you can even use the container as a feeding bowl. The food contains soft food bites in gravy. This specific recipe has beef and beef liver as the protein source. Dried peas and carrots are added for vitamins and nutrients. Fish oil is also included. It keeps the coat healthy and supports overall cardiovascular health. Like the brand's dry kibble, natural ingredients from trusted suppliers are used in this product to ensure that your puppy is getting a high-quality food that's easy on the stomach. Once you have established that your dog has a sensitive stomach, you'll need to make some dietary changes. This process can involve a lot of trial and error. You'll need to narrow down the possible irritants and find a limited-ingredient option that's safe for your puppy. The first thing you'll want to do is take a look at their current food. If your pup is currently suffering from some of the undesirable symptoms of a sensitive stomach, you know which particular product caused it. Examine the ingredients closely and make note of any potential irritants. See what type of protein is used and if there are any chemical additives. When you're searching for a replacement food, you can use this information to see what you shouldn't get. If you suspect that it's unnecessary additives or fillers that are causing problems, find a new food that uses natural alternatives. If you think that chicken meal is to blame, go with a dog food that uses a different protein source. It can take a couple of tries to finally find a dog food that works for your pup. However, your puppy will benefit from the change you make. Once you've found a great new food for your puppy, take time to introduce the new formula. Sudden dietary changes can make symptoms get worse. Start by adding a bit of the new food into the old kibble. Slowly add more new food until you have completed the transition. During the change, keep an eye out on how your puppy responds. Their symptoms should stop and everything should go back to normal. If it doesn't, you may want to seek professional assistance from a veterinarian. It's never fun to watch your young puppy deal with stomach issues. They're a part of your family now, so you need to do your part and find a great limited ingredient dog food to provide them with relief. With a great dog food, your puppy will have all the protein, vitamins, and nutrients they need to grow up into a healthy dog.